The Eurogamer Expo (or EGX) was held in Birmingham, England a little over a week ago and Rebellion was there to not only show off the next Sniper Elite title, Sniper Elite 4, but specifically to show off the co-op. While we've heard that the game will support two players throughout the campaign since the initial announcement, this is the first time we've had a chance to see that co-op in action. 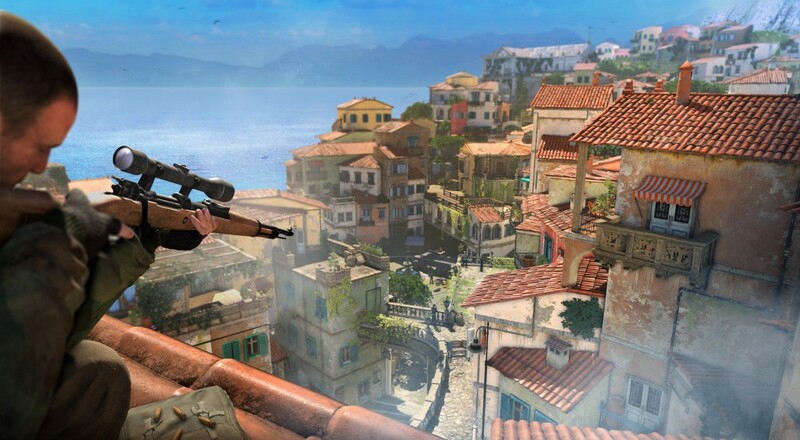 True to previous entries, the mechanics of Sniper Elite 4 allow players to find their own vantage points from which to shoot, thereby drawing enemy fire/attention away from their buddy. In the video below, lead designer Paul Wright and community manager Rob Dale engage in some co-op sniping while head of creative Tim Jones provides the running commentary. One of the interesting tidbits from all this is that the stages seem to be a bit more open-worldish. Paul and Rob start in a safe area where they can gear up and speak to NPCs to get mission objectives. Once they leave the area, they're free to explore the Viaduct area and make their way through to complete the objectives they've been assigned. Sniper Elite 4 will see its full release on February 14, 2017, for the PC, PlayStation 4, and Xbox One.